I recently submitted a bug report on PEAR regarding a long standing issue with the PEAR installer tool: there is no support for HTTP 302 (redirect). This condition effectively limits the hosting possibilities of PEAR channels e.g. a PEAR channel can not be accessible through a DNS cname aliases. Suppose I have hosted a PEAR REST channel on Google Project @ http://mediawiki.googlecode.com/svn and now I would like to make this channel friendly through a nicer URL like " mediawiki.pear.jldupont.com ". Here is a quick tutorial on how to install PEAR's WEB Frontend installer. Above is a sprout automatically updated of all the PHP PEAR channels I know. The list is composed of entries I add to my Del.icio.us links with the tag pear-channel. Then this list is processed through a YAHOO! Pipe and finally embedded in the ''sprout''. I grew tired of logging on my FeedBurner account page to get my statistics data so I devised a Yahoo! Pipe to automate things. The Pipe can be used on any publicly accessible FeedBurner feed: here. Some good news though: yum is installed by default. Hooray! Even with this effort, I wasn't able to use the pecl command and had to resort to go through the pear command instead. See example next. Say one needs to create objects in one namespace in a controlled fashion (i.e. avoid duplicates, avoid loss); what strategy can one employ? The basic issue one has to deal with comes from the fact that possibly multiple processes are actively accessing a given namespace thereby collisions can occur: in namespace N, process 1 creates object O1 whilst process 2 does the same (i.e. creates object O1). 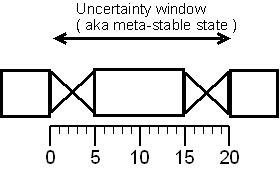 The left-hand side diagram illustrates the problem: the competing processes race to win the creation event during which time a meta-stable state exists i.e. no one process can be certain (to a reasonable degree) which will win the race. There are (at least) two main strategies to address the problem: an optimistic and a pessimistic one. The optimistic strategy can be used in patterns where a process is considered reasonably alone in accessing a given namespace. Example: a user accessing is private file folder. The pessimistic strategy must be employed in situations where multiple processes potentially access a given namespace. Example: an application's user creation flow. The notation object[X] just means: an object with for identifier X. Use Case: user X tries to register to the application with user-name UN1 at the same time as user Y goes for UN1. The advantage of this algorithm stems from the fact that only 2 HTTP requests are necessary for each creation instance. Don't forget that the initialization file for the CLI operation of PHP is most probably different than the one used with Apache. One irritant on the WEB I found a solution for: have you ever posted questions or comments to a site that didn't include automatic email notification when the question/comment got feedback? It happens to me all the time. I now use GoogleAlerts to track my whereabouts on the WEB. The usage pattern is simple: just form the habit of always signing your post with a distinctive mark and set an alert on this mark. With my name, this is easy as it is not so common. I have to sift through countless RSS feeds all day seeking more information based on keywords I find. I wanted to automate the process just a bit so I devised a GreaseMonkey Firefox user script. Usage is simple: just select the text to search and press " alt c " which will automatically bring-up the result page on Google Search. One can find the script here on UserScripts.org.